Does your property include sidewalks, walkways or a concrete patio? What is their current condition? Do they add value to your home or lower its appeal? These areas often make your home’s first impression, so it’s important they make a good one. If they are covered in black stains, streaks and grime, they are far from inviting. To make these areas shine again, try pressure washing in Aurora, OH. A good concrete cleaning will restore your exterior areas to their former brilliance and boost your home’s curb appeal. 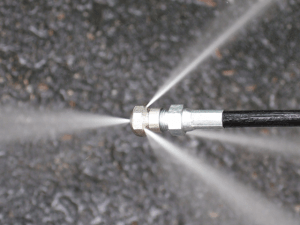 As you take on this task, you must choose the appropriate pressure washing system for concrete cleaning. Keep the following tips in mind as you begin your project. Select an appropriate pressure rating: How serious are your stains? The tougher the stain, the higher psi you will need. For most concrete projects, look for a rating of at least 3000 psi. This will ensure the system is tougher than your grime. Find the best flow rate: This helps determine the power of the water stream. It affects how quickly the stain is cleaned. A flow rate of four gallons per minute is usually a good level, providing a powerful stream for concrete projects. However, you may be better off with five or six, if available. Pick the right nozzle: For concrete, you’ll probably want high speed and power. A turbo nozzle or rotary nozzle can provide the speed and power you need for your project. Use a convenient washer mount: Wheel-mounted pressure washers are great for sidewalk cleaning and other large, flat areas like patios. They will help you complete your project faster, with less work and less water use. Adjust water temperature: If you need to remove oil or other commercial-type stains, hot water washers are better. The drawback is that they are typically more expensive and heavier, making them more difficult to use. For non-oil stains such as algae, cold water works fine. Add the right detergent: Coat your concrete surface with an appropriate soap before you begin power washing in Aurora, OH. Depending on the type of stains you want to remove, you can select from a variety of common mixtures. Degreasers and “green” cleaners are among those available. Protect the environment: Keep in mind that only rain water is supposed to flow into drains. Block any small drains located near your project to ensure cleaning solution doesn’t flow into them and create a hazard. Contact the pros: Of course, the best (and easiest) method for pressure washing in Aurora, OH is to let the professionals handle it. Contact the experienced technicians at Central Window Cleaning for all your concrete cleaning needs. Get a free estimate today.